Hey guys! So I have a new feature for you - and it starts today! I don't know about you, but I absolutely LOVE to travel. WANDERLUST is a feature in which I will share my travel stories, photos, rants, raves and adventures. Or maybe it's just picking a locale I would love to visit, and am seeking your insight. I feel super lucky because 1) I now have a job that allows me the flexibility to travel whenever I want (provided I can afford the trip), and 2) my boyfriend loves to travel too - PLUS, he has lived all over the world, was born in Brazil, and has family spread across quite a few continents. 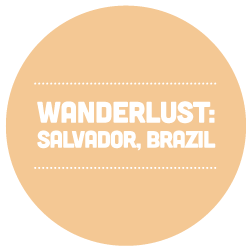 And so, my first WANDERLUST feature will take us to my partner's homeland, the South American nation of Brazil. On December 26, 2012, I boarded a plane to Sao Paulo, Brazil by myself (my final destination being Salvador, located in the Bahia state). After a few hiccups - first with my travel visa, then a delayed flight, chaos at the Sao Paulo airport, and a major freakout in the Salvador airport (somehow I walked into Departures instead of Arrivals... don't ask me how this happened. I have no idea. Luckily there was one passenger in the airport who spoke English and came to my rescue) - I made it to Salvador a long 24 hours later. But it was worth it! I promise! I was greeted by Pedro and his wonderful family, and I spent a glorious 10 days on the equator. There was perfect weather (which was AMAZING, because I literally left a snowstorm behind), tons of food, good times, great company, and lots of beer and cachaca. Pedro's family rented a boat for a day too, which was so much fun (even though I got a pretty awful sunburn). And best of all, I got to spend New Year's Eve with Pedro for the first time in 4 years. It was so special. There were even fireworks (and they were really good fireworks too). I also had some of the best sushi I have EVER eaten. I'm talking amazing sashimi. And this is coming from a girl who has also been to Japan. And the samba! AH the music. Who knew I would love to dance so much (haha.. maybe it was all the cachaca)! Check out some of my photos below! Visiting Brazil was an experience I wouldn't trade for anything (even if I had to abandon my pup for 3 weeks)! I really can't wait to go back. There are plans in the works to visit again this December for Pedro's cousin's wedding. And I am so excited! Ready for more WANDERLUST? 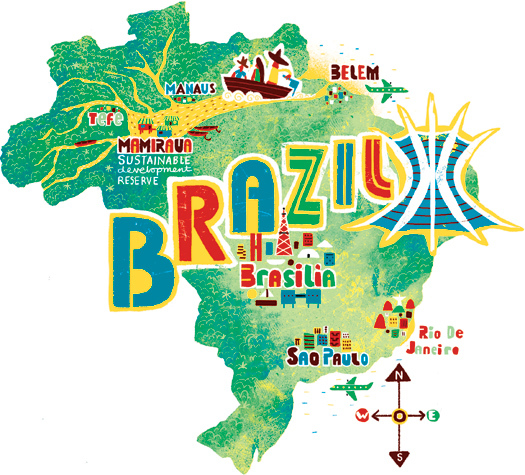 Check back next week for Brazil Part II, Rio de Janeiro! PEPE LUIGI!!!!! The cutest pug ever. He's Catarina's pup. Pedro and I, in our cabana at Praia do Flamengo. We never have nice photos together, but I actually like this one. Crabs and coconuts on the beach, Pedro sipping coconut water from a coconut. PUPPY LOVE: Rudie's 1st Birthday! Well friends, I'm still enjoying the beautiful long weekend. Probably should be back working, but I decided to take the day off like everybody else. I'm glad I did. Today, May 20, 2013 - is my little pup's first birthday! He's sleeping away the afternoon, while I watch Dawson's Creek on Netflix. He had a little too much fun at the park this morning. I can't believe he's one year old already! It's just flown by. I feel so lucky to have this little monster in my life. So, thanks for putting up with my multiple posts about my dog. He's just kinda the best. The photo to the right was taken today. Rudie was snuggling in his bed with his toy panda! His (ahem.. my) friend Spencer gave him this super cute toy. Or Rudie may have stole it. Not quite sure. Rudie loves Spencer - you should check out her blog if you like film+movies+tv on tumblr: roadmovies.